A 68 year old woman was seen in the outpatient clinic because of difficulty in swallowing and sensation of a "large foreign body" in her throat, of several months duration. 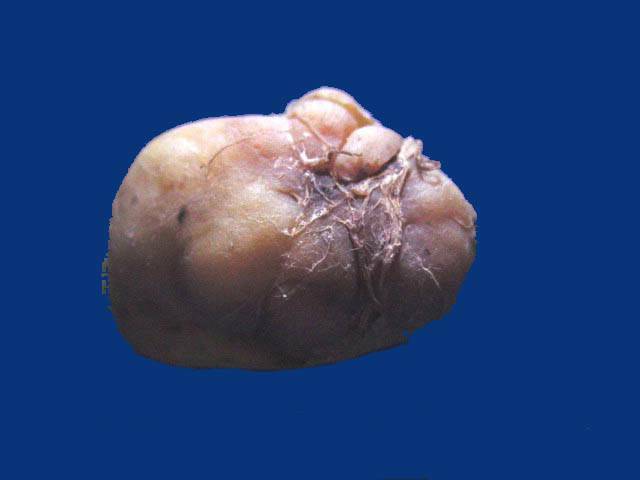 �On physical examination, a large, solid, pale yellow tumor was located in the soft palate. 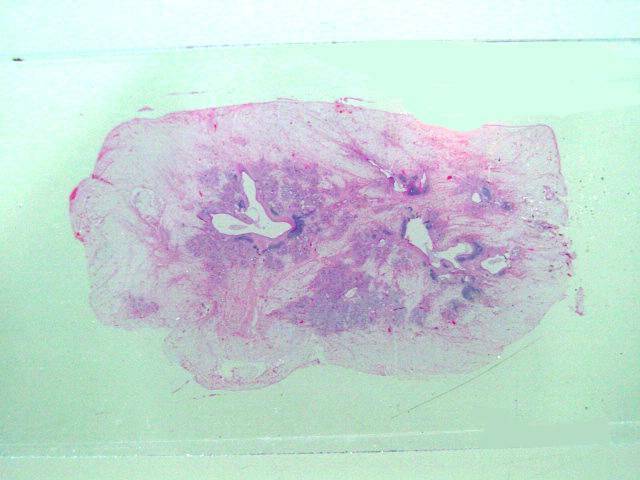 �Complete resection of a large lipoma-like tumor mass was performed. 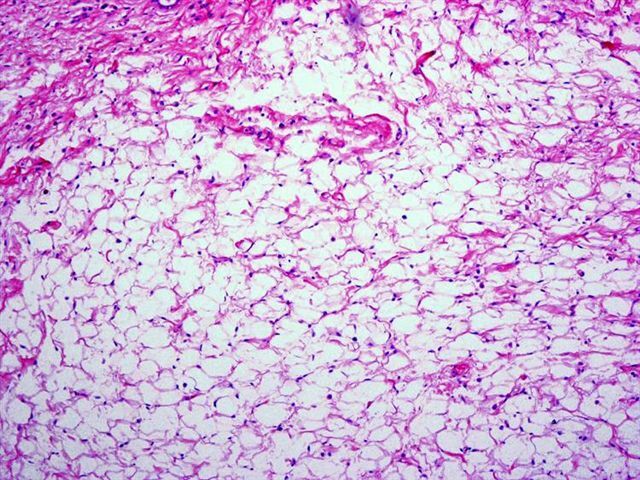 Microscopic findings:� On low power (figure 3), a tumor characterized by peripheral lipomatous tissue and central salivary gland elements with prominent dilation of ducts is seen.� In the periphery, there is a predominance of adipose tissue that looks like a lipoma (figure 4). 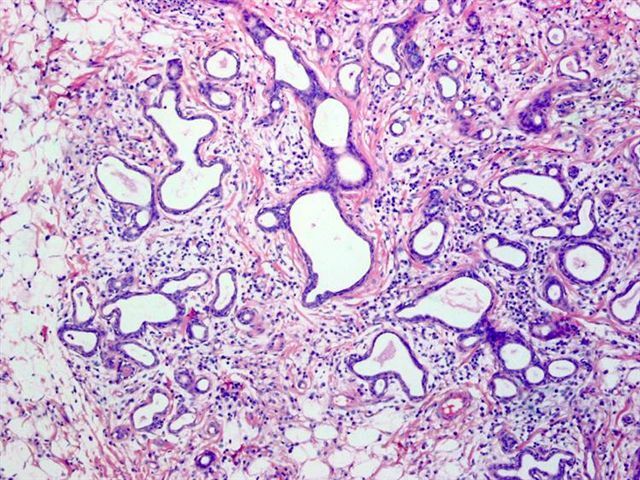 �In the central area, there is a mixture of adipose tissue, fibrous trabeculae and numerous salivary gland acini.� Some dilated ducts are also seen (figure 5).� Other areas show acinar predominance and numerous ectatic ducts lined by flat cuboidal epithelium (figure 6).� Numerous dilated ducts are arranged in a lobular-like structure with prominent fibrosis (figure 7). 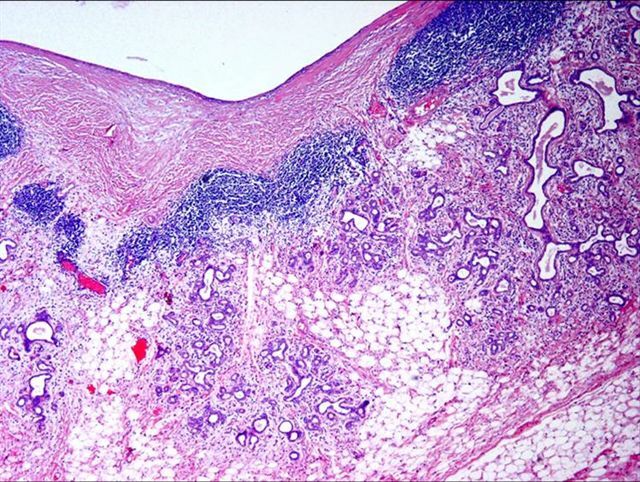 Intraoral lipoma is a well-known entity (1, 2) but lipomatous tumors including salivary gland tissue containing clustered or peripherally located ducts in acinar glandular tissue are uncommon. 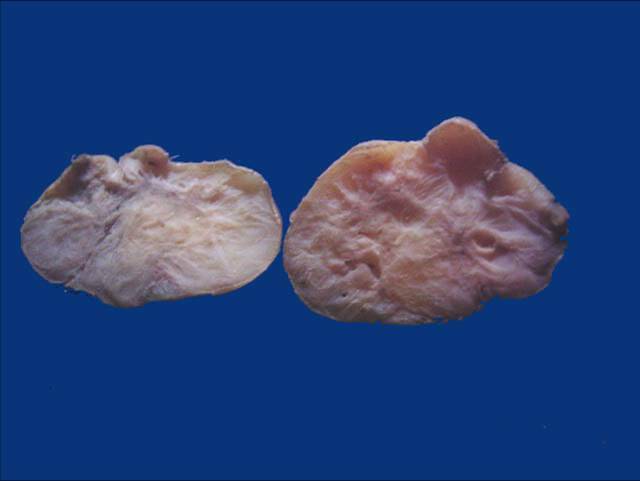 �Under the designation of sialolipoma, Nagao et. �al. 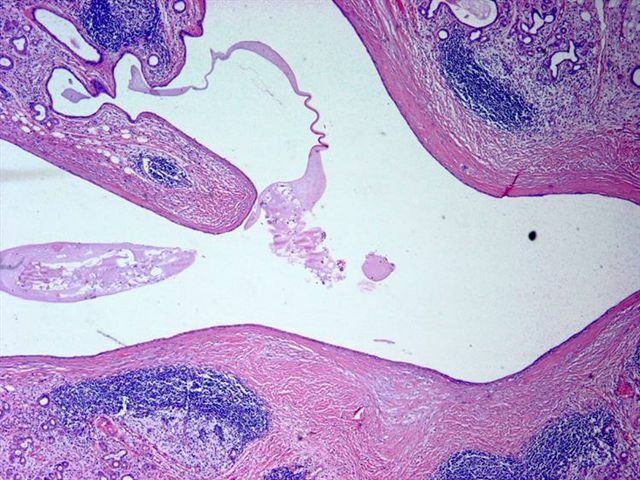 from Japan described a new variant of salivary gland lipomatous tumor (3).� They reported seven cases, five men and two women, aged 20-75 years old.� Five tumors were located in the parotid gland, one in the hard palate and one in the soft palate. 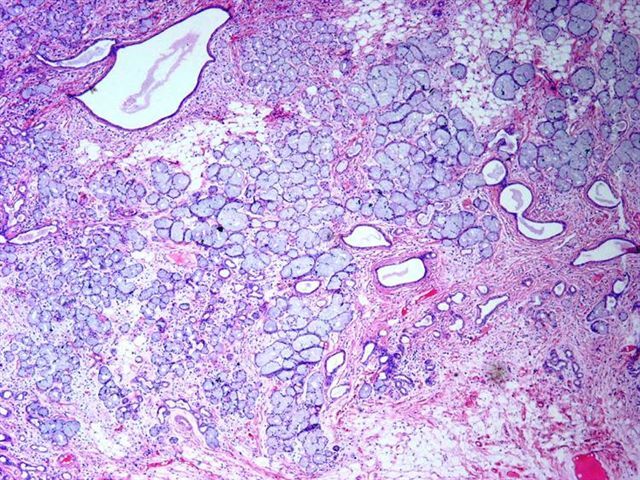 Grossly, the tumors were well circumscribed and resembled an ordinary lipoma.� Histologically, they were characterized by a proliferation of mature adipose tissue intermingled with acinar, ductal, basal and myoepithelial cells of normal salivary gland.� Duct ectasia with fibrosis and prominent lymphoid infiltrates with nodular aggregates in the stroma is a constant finding. 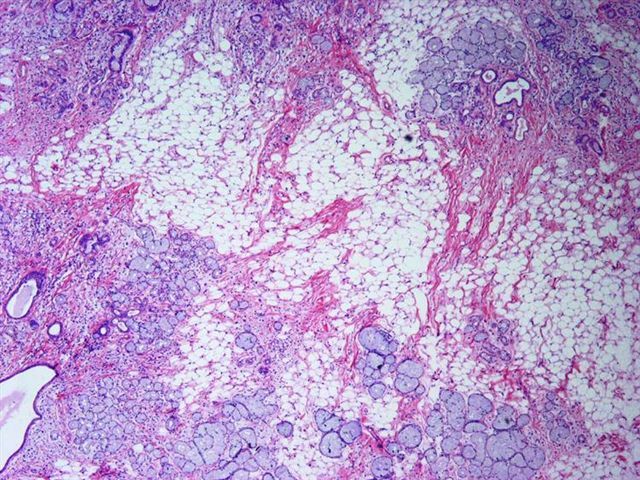 These tumors have benign behavior.� No recurrences have been noted, including from recent reports in the floor of the mouth (4) or the parotid gland (5). This Case corresponds to the fourth reported case of sialolipoma located in the oral cavity and the second in the soft palate.